Many people ask why you should mulch and what are the advantages of using mulch in the garden. A complete guide to mulching is given including what is mulch, how to apply mulch, and organic and inorganic mulches. Mulch is a material which is used to spread over the surface of the soil in the garden as a covering. It retains the moisture in the soil and keep the soil cool. Mulching will encourage the garden to thrive and help to conserve water. The mulches can reduce water loss from the soil, improve soil structure and minimize weed competition. 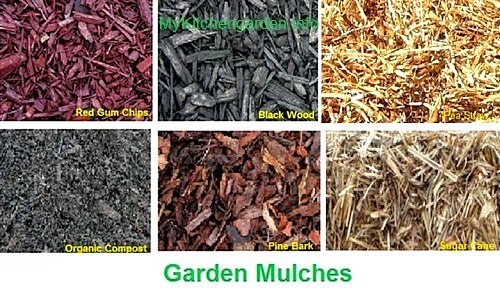 Garden Mulch is great for all trees and plants, but different plants need different mulches. Some mulches will break down quicker than others. Some plants like bearded iris don't like mulch because its rhizomes need to bake. Mulch should be applied in mid spring or early summer, but can be applied at any time. The most important advantage of mulching is to keeps the soil moist and save water. As mulch prevents the top soil from drying out, it assists with water retention in the soil. Mulching can reduce watering by about 50 per cent. Mulching keeps the soil temperature stable in the root zone. Mulching prevents weeds, which compete with plants for moisture and nutrients, and your garden look greener, healthier and more productive. An organic mulch adds extra organic matter to the soil. Mulch can protect top soil. Mulching makes the garden bed look more attractive. >Mulching allows to recycle your garden's waste products. Mulching solves the problems of garden waste disposal. Mulch can give landscapes a well-groomed handsome appearance to the garden. 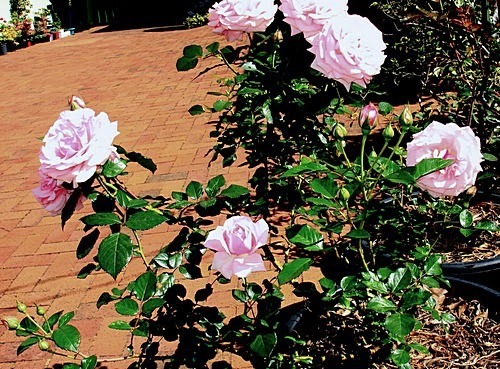 The picture below shows a rose plant in a container which has a top layer of sugar cane mulch. Note the number of flowers and buds. There are several mulches that vary in their appearance and texture. The two types of mulch are Organic and Inorganic. Not all plants like organic mulch as it can cause rot. These plants will be best with an inorganic mulch. Organic mulches break down slowly and release nutrients into the soil improving the soil's fertility. Organic mulches add organic matter to the soil which encourages earth worm and soil microbiological activity improving soil structure and drainage. Composted manures such as cow, sheep, horse. Compost makes a great mulch. Straw based mulches like pea straw, lucerne and cane are quite common. Bark based organic mulches (fine,medium and coarse) take longer to break down so you don't have to top up frequently. You should compost sawdust prior to use and mix with nitrogenous fertilizer and apply a thin layer only. You can put a layer of compost and use it as a soil conditioner, and then add a straw mulch over it. Although lawn clippings can directly be used as mulch, it is better to put them in the compost. You should not use pine bark repeatedly as mulch as it causes a build up of tannins in the soil. Also it can stunt the growth of your veggies. I use compost and cane sugar straw in my growing organic blueberry in containers. Inorganic Mulch will retain moisture keeping the ground underneath cool and moist but will not don't break down. They come in a range of colours and look good. They are often used in pots of cacti and succulents that do not require additional organic matter. If you put pebbles in your garden, do it where no leaves will fall, otherwise it will look dirty. Examples of inorganic mulches are rocks, boulders, gravel and stone river pebbles and coarse river sand. Remove any grass, weeds and dead plants from the bed before mulching. Put in new plants before putting mulch. If you wish to use an irrigation system like a drip system or an automatic watering system, put the pipes before mulching. Before applying mulch, fertilize and water your garden. Mulch to a depth of 7.5-10 cm (3-4 inch). The depth of mulch, however, depends on the type of mulch used. For coarse mulches a layer of between 2 and 6 centimetres is enough. Do not put mulch against the stems of plants as that can cause trunk rot. Top up the mulch regularly to maintain desired thickness. Remember some mulches will break down quicker than others. Note that you will still need to water your mulched gardens as and when required. Note that too much mulch can be harmful. It can create excess moisture leading to root rot.